"My water stinks. It still burns to take a shower. There's no way they can say it's safe." After Michigan's governor announced the state will stop providing free bottled water to residents of Flint — afflicted four years ago by lead-tainted drinking water — churches and charities said Monday they're bracing for a surge in people seeking help. "Normally we give out whatever a family wants," said Bill Quarles, a deacon of the First Trinity Missionary Baptist Church. "But now we may have to limit that until more supplies come in." The church has been handing out bottled water for the past three years, and typically sees about 100 to 200 cars a week. With fewer resources for residents, First Trinity isn't sure what to expect when the cars come through beginning Tuesday. Much-needed donations from Fort Wayne, Indiana, and Baltimore, Maryland, aren't expected at the church until the weekend — and contributions have already been dwindling as water crisis no longer grabs daily headlines. "The country thinks that the water is fine," Quarles added, "but the residents and the city of Flint do not trust what's being said." The state's decision to close the four remaining bottled water stations comes as Gov. Rick Snyder said Friday that strides have been made to reverse the high levels of lead that were found in the water supply. The city's water has tested below the federal lead and copper limit of 15 parts per billion (ppb) for about two years, state officials said. Levels of 4 ppb were recorded in Flint during the first three months of 2018. "We have worked diligently to restore the water quality and the scientific data now proves the water system is stable and the need for bottled water has ended," Snyder said in a statement, adding that state taxpayers have given more than $350 million to the struggling city, in addition to $100 million from the federal government. "We will now focus even more of our efforts on continuing with the health, education and economic development assistance needed to help move Flint forward," Snyder said. Residents and local officials criticized the move, noting that many in the city of 100,000 remain distrustful after their water supply was contaminated with lead for 18 months. The contamination happened in 2014 and 2015 when officials of the financially strapped city switched to using river water that wasn't properly treated. That untreated river water leached lead from pipes into Flint's drinking supply, and later tests showed high lead levels in some local schoolchildren. The state of Michigan settled a lawsuit last year agreeing to spend $87 million to rip up and replace miles of waterlines leading to at least 18,000 Flint homes by Jan. 1, 2020. More than 6,200 homes have had their pipes replaced so far, Snyder said Friday. The state will continue to provide free water filters, cartridges and water testing kits until all the lines have been replaced. In addition, a lawsuit deal with the state and school groups reached Monday could provide $4.1 million toward helping Flint children get necessary tests and screenings to determine any special education needs. Kristin Totten of the American Civil Liberties Union of Michigan said the agreement is a "critical first step," but there's still more litigation over Flint children with disabilities. Direct access to clean water, meanwhile, remains a serious concern. "Over the past few weeks, residents of Flint have been expressing their great anxiety over the potential end to the supply of bottled water," Mayor Karen Weaver wrote in a letter to state officials on Thursday. "Free bottled water should be provided to the people of Flint until the last known lead-tainted pipe has been replaced." 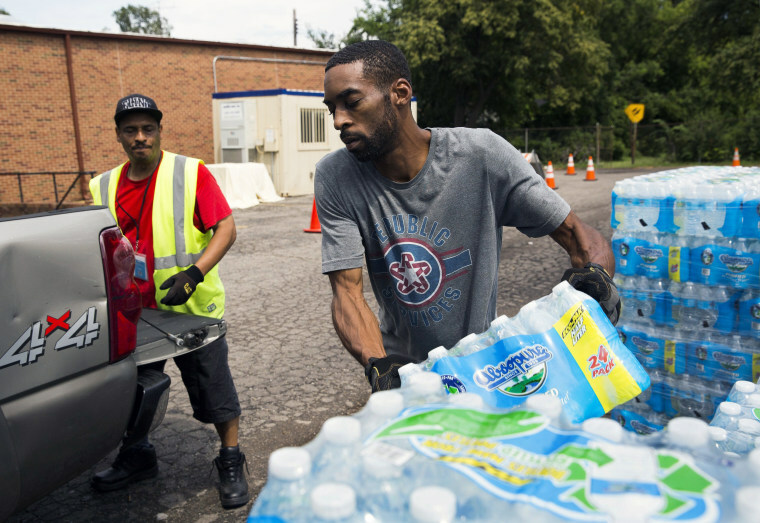 The fallout from the contaminated water crisis prompted criminal charges last year against several state officials for involuntary manslaughter after a Legionnaires' outbreak in the Flint area led to the deaths of at least 12 people in 2014 and 2015. Among those implicated are Nick Lyon, the state's health chief, and Dr. Eden Wells, the state's chief medical officer charged with obstruction of justice and lying to a police officer. Preliminary hearings were held last month in their cases. Flint resident Barbara Davis, a secretary at Mt. Calvary Church, one of the houses of worship providing free bottled water, said there remains acrimony toward the state. "There's still the concern, there's still the frustration," Davis said. "The water still needs to be provided by the state until people are comfortable with what they're saying. After everything, you begin to be mistrustful of what we're being told." Flint resident Melissa Mays — who filed the lawsuit that led to a court-ordered agreement under which the state and federal governments are paying to replace pipes made from lead or galvanized steel — said she still cooks with bottled water. "My water stinks. It still burns to take a shower," she told The Associated Press. "There's no way they can say it's safe." Flint resident Mary Corbin told MLive.com that she also uses water in bottles for more than just drinking or cooking, but her personal hygiene as well. "I think it's really cruel what they're doing to us as a city, as a whole," she said. "We've been struggling over four years almost. It's just cold-hearted — now they're taking our drinking water away from us."